Growing up in a family known for their politics, Lauren always cared deeply about the world. 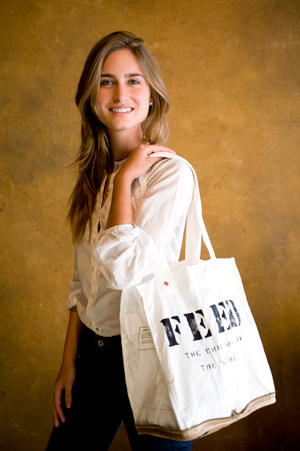 So she created FEED Projects, a line of fashionable bags that could make an impact on hunger, and would raise awareness. Lauren talked to us about the genesis of FEED, her independent style of leadership, and more. Growing up in Texas, in a family known for their association with politics, Lauren always cared deeply about the world, she was always informed, and surrounded by people making a difference. But, she had a different approach to affecting change than her family; she didn’t go into politics or become an independent activist. In 2004, Lauren was named an honorary spokesperson for the UN’s World Food Programme, travelling around the world and seeing firsthand the plight of hungry children and the work to aid them. Lauren came up with an innovative way to tackle the challenge. Lauren created FEED Projects. Taking her talents as a designer and her experience as an accomplished model, she created a line of fashionable bags–and later other clothing and accessories–that would could make an impact on hunger, and would raise awareness as people walked down the street showing off their FEED gear. Now 26, she’s come a long way from the first FEED Bag she designed in 2006. Today FEED has been responsible for providing over 58 million meals to children around the world, selling over 550,000 bags. While FEED is a for-profit, in 2008 she helped launch the FEED Foundation, a not-for-profit focused on improving the global food system. Lauren talked to us about the genesis of FEED, her independent style of leadership, and more. My big idea was very simple- to create a reusable shopping bag that would FEED one child in school for one year. What was the inspiration for FEED? FEED is inspired by the idea to make giving back to help fight world hunger really accessible and easy for anyone and everyone. By attaching a clear donation to a consumer product, a bag, you can empower people to shop and do good at the same time. The inspiration for the design of the original FEED 1 bag was the bags of food rations I saw being distributed around the world. What problem did FEED first try to address? The problem FEED has addressed from the beginning is that of world hunger. It is seemingly an overwhelming and insurmountable world issue. We wanted to make giving measurable and show people that it can be easy to help in large and small ways. FEED may not solve world hunger, but to date we have been able to give over 55 million school meals to kids in the poorest countries around the world. How did you know it was working? We know it is working when people and retail stores buy our products. I was born in Denver CO, but spent most of my childhood in Houston TX. My dad is an entrepreneur, who has spent much of his career working on educational software and now in oil and gas. My mom started a non-profit when I was little called Karitas, and now has her own company called Teddy Share, who FEED has partnered with in making the FEED teddy bears. I went to Princeton University, and majored in Anthropology with a certificate in Photography. What was memorable about your time there? College was a wonderful time to really explore my interests. I ended up writing my senior thesis about gender inequality in the developing world. And I would take lots of pictures when I traveled with the UN World Food Programme. Therefore what I started exploring in college are things I am now working on through what I do with FEED. What figures do you most admire? Whose leadership model do you follow? Whom do you seek out for advice? There are many people I admire and seek advice from, but for the most part I just follow my gut instead of trying to mimic someone else’s leadership style. How is your life different now than it was before you started FEED? My life is 100% better since FEED started. I wake up everyday excited to face the inevitable challenges that come with running a small business. I know that for every product I design, or that we sell, someone’s life has been impacted in a positive way. What excites you or concerns you about your generation? I feel very lucky to be part of my generation. There are endless possibilities, and the rules are constantly being broken. I am slightly concerned that with all this online and mobile connectivity that we will forget how to connect for real and in person. If you had 60 seconds with President Obama what would you tell him or ask him? If I had 60 seconds with President Obama I would probably ask him who he plans to help the hungry in our own country and abroad as well as the farmers. Farming has become so industrialized, which is having very negative effects in the quality of food we consume and the overall health of our nation. How has technology and social media affected your work? We always Facebook and Twitter any FEED news. They are fabulous, free tools for small ventures like ours. We also have a few videos on YouTube that really help illustrate what we are about. What was or what is your biggest challenge? The biggest challenge we have, like any business, is growing the FEED brand in an authentic and sustainable way. We also ask stores to make less of a margin on our products because we are giving so much away per product. This does not always work for stores. What assets or challenges do you have or face because you’re young? I think age is neither an asset nor challenge, it all depends on how you present yourself. Age is sort of irrelevant. How would the world be different in 10 years if you had your way? If I could wave a magic wand I would love for all children around the world to have good nutritious meals every day. Either a designer, a photographer, or maybe a humanitarian aid worker… But I do think I am doing what I was meant to do. Follow Lauren and her work on twitter @laurenbushtweet. David D. Burstein is a young entrepreneur himself, having completed his first documentary 18 in ’08 for which he was awarded a $10,000 grant from Nancy Lublin’s DoSomething.org. He is the Founder & Executive director of the youth voter engagement not for profit, Generation18. His book about the millennial generation will be published by Beacon Press in fall 2011. David and Fast Company are producing Change Generation, a new series profiling a young generation of change-seekers. We’ll be covering everything from educational activists to champions of political reform, creative entrepreneurs, and outright thrill seekers. We’ll be hosting Q&As as well as video profiles with production partner shatterbox.